The Private Booking feature can be used when you are creating a once-off custom class booking for an individual or group enrolment. This feature allows you to create the class, set the fee and take the enrolment. You might use this feature to create one-on-one booking for extra tuition, a private dancing lesson for a couple, or a custom corporate class booking for a small group of staff. To begin, open the quick enrol window. Type in a course name in the 'Enter course or item' field. This needs to be an existing course - even if the class content is not the same you can select one that is similar Salsa eg. Latin and American for a private salsa booking. If you regularly take private bookings you may prefer to set up a course specifically for that purpose. Once you have added the course you want to create a private booking for, you should see a button called 'Create Private Class' in the top right hand side of the window. 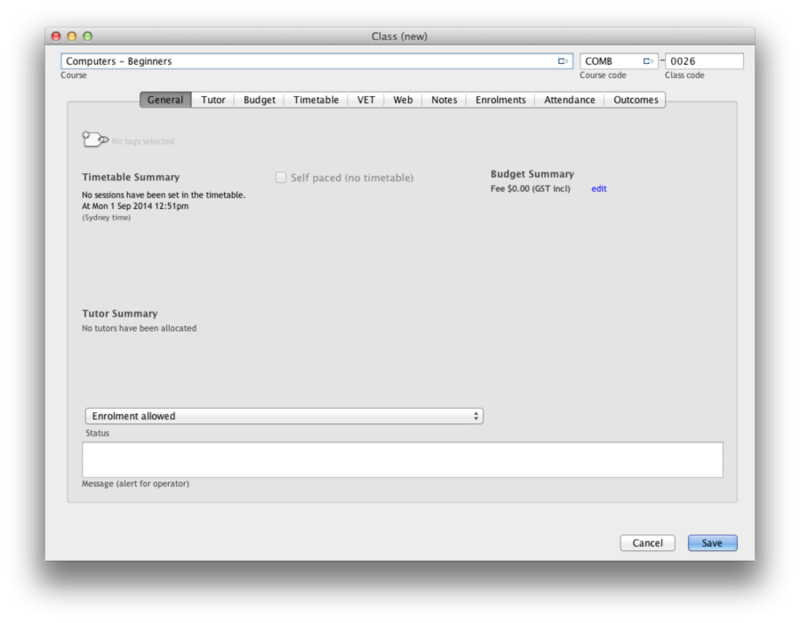 Click on this button; this will open up a separate new window for you to create the custom class. Set a class code, a site and room and create a fee. Like all classes, the fee is per person, so if you are enrolling a couple, you can either set the fee to half the booking cost and charge them both. Select a tutor to deliver the class. Create one or more sessions for this class. The process is the same for creating sessions in other classes. If you double book a room or tutor, you will see a warning icon in the calendar view. Add the contact details for the first student, and enrol them in the class, as per a normal enrolment. Add each of the other contacts attending this class. They will be pre-populated with an enrolment in this class. Enter the payer and payment details and save the enrolment.